Preventing child abuse needs to be imbedded into our thinking, attitudes and practices. A cultural change will be required on many levels to ensure Kambrya College continues in its development towards an organisational culture that protects children from abuse and reflects our commitment to child safety. Child protection is a shared responsibility between all employees, workers, contractors, associates, and members of the Kambrya College parent / carer community. The safety and wellbeing of our students form a central and fundamental responsibility of our College and compliments our vision and values of: Respect, Integrity, Care and Excellence. The support, respect and commit to providing all children with positive and nurturing experiences, as well as our staff and volunteers. Actively working towards listening to and empowering children. 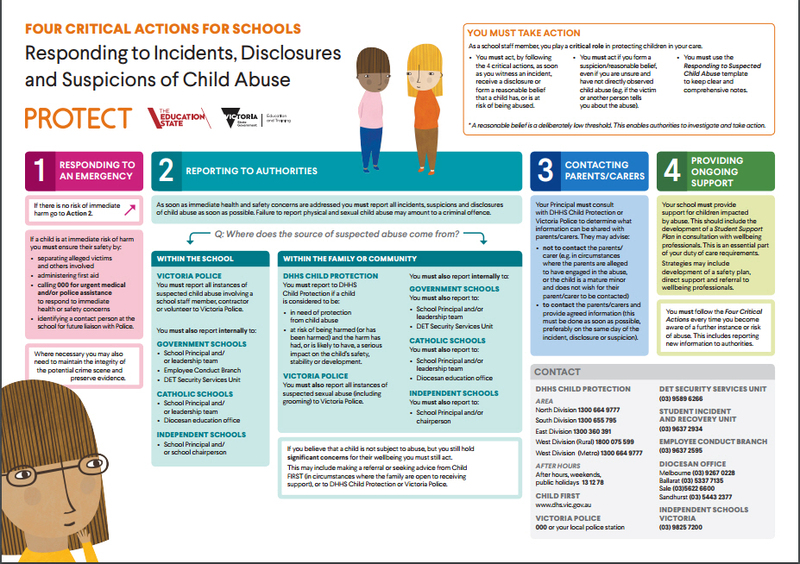 Creating systems to protect children from abuse and will take all allegations and concerns seriously; having mechanisms in place to ensure consistency in line with school, DET and DHHS protocols. Teaching children and young people the skills and knowledge to understand and maintain their personal safety and wellbeing. Promoting cultural safety and safe learning environments for Aboriginal children, the disabled and children from culturally / linguistically diverse backgrounds. Kambrya College commits to engaging with, listening to, the views of parents and carers about our child-safety practice, policies and procedures. Our College and governing body will be transparent in our decision-making with the wider school community (where it will not compromise the safety of children or young persons). Additionally, we acknowledge the cultural diversity of students and families and being sensitive to how this may impact on student safety issues. The following booklets, processes, protocols and policies provide a unified approach to how Kambrya College, parents, carers, wider school community and any person associated with child connected work can protect our children from child abuse.